Armed with the success of the Hall Brothers greeting cards, J.C. and his brother continued to innovate. Their first foray into other product lines came in 1917 when the Hall brothers “invented” modern gift wrap. During the peak Christmas season, the Hall Brothers ran out of solid-colored gift dressing, and improvised by selling fancy decorated French envelope linings. Those sold out so quickly that the brothers decided to begin printing their own gift wrap. 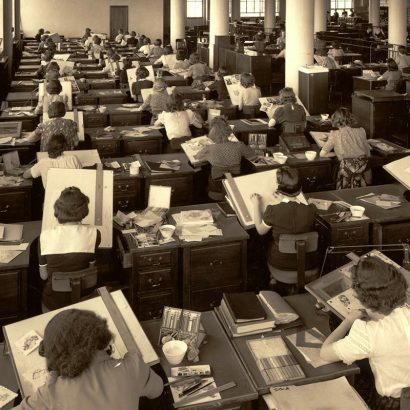 Pictured at right, artists creating the latest designs for Hallmark in one of the company’s early design studios. But the innovation didn’t stop there. In 1932, Hallmark signed its first licensing agreement with one of the 20th century’s most recognizable names – Walt Disney. Another innovation was the company’s patented “Eye-Vision” greeting card displays, which took cards out of shop drawers and put them on display racks where people could easily see and read them. The way you see greeting cards displayed today was an industry first created by Hallmark.